When I first came to camp as a Junior boy, I was very shy and never really ventured out of my comfort zone. I was super nervous on that first day, but luckily, I had a friend from my town who was coming back for his second summer. He introduced me to everyone in my division during a game of Gaga, which turned out to be my favorite sport at camp. More importantly, those people turned out to be some of my best friends. 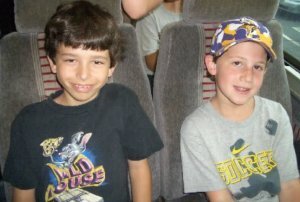 Growing up with everyone, we became as close as brothers. We would argue and fight, but at the end of the day, we all had each other’s backs. We had some awesome counselors along the way who became role models to all of us. As I got older, porch talks with them helped me learn a lot about life, and about what I wanted to do. I also started trying new things, whether it was new food in the dining hall or a new activity around camp. As a culmination of many years together, our division got to be the first “Chen-A-Wanderers,” and take a 10 day trip to California. I had never been to the West Coast before, and I pretty much fell in love with it as soon as we hopped off the plane at LAX. I got to see San Diego, LA, Hollywood, the Grand Canyon, Vegas, and so many other places, all with my best friends in the world. It really was a life-changing trip, and when college applications rolled around a few years later, I knew exactly where I wanted to go. Half of the schools I applied to were in California, and I wound up at the beautiful UCLA. If it wasn’t for camp, I might be stuck at a school where it actually rains! As a Junior Counselor the following summer, I was very intrigued to see the other side of things at camp. I was lucky enough to live in the same bunk as my older brother Scott, and I was able to create bonds with the campers almost immediately. 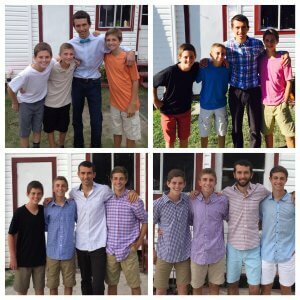 To this day, even though I moved out of their division, I still think of them as my little brothers, and I’m beyond excited to see how they do as CITs this year. The next year, I moved divisions and became an Assistant Group Leader to Anthony Cascio, who taught me how to use creativity to create a memorable summer for the kids. He was also a role model in his work ethic, always going above and beyond to make things fun. That summer was definitely a good learning experience and helped me to become the type of counselor that I always wanted as a kid. The next two summers, I was a Group Leader for the same kids, and it was awesome to watch them grow up. They all had such different personalities, but they never failed to make me laugh. I got to encourage them to try new activities, just like my counselors did for me. My favorite thing was coordinating their Lip Sync, something I was always too shy to do as a camper. They got really into it, and we took home the gold in 2016. In those two summers as a Group Leader, I finally got out of my shell and made a ton of new friends. I think one of the most important things to learn in life is how to make friends in new environments, and I can say without a doubt that college has been so much better because I learned this lesson at camp. Finally, in 2017, I won Group Leader of the Year, and it was one of the best moments of my life. Being surrounded by all my friends and little brothers cheering me on made me realize that working with kids is really what I love. So, I decided to switch gears a bit, and although I’ll be graduating next year with a degree in computer science and engineering, I am going to become a teacher. All in all, camp has helped me to be more confident and outgoing, which is important when you go to school 3,000 miles away from home. It has given me friends from all around the world and has shown me what makes me truly happy. People at school often ask me why I continue to love camp, and I never have a real answer. It’s something that can’t be explained, even after living through it for twelve summers. I still have a lot to learn, but because of my experiences at Chenny, I know I’m ready for anything.